The cakes post-decoration! Don't they look great?? I love the WI. As an expat, the whole concept of the Women's Institute was not something I grew up around but I love the idea of getting involved in our local community and meeting such fab and interesting people at the same time! Well, the Nottingham City WI is a fab example of a great WI. Kerry Edwards is the President of the City WI and I've come across Kerry whilst running Cake Eaters Anonymous and also via her blog where her amazing cakes caught my eye! I've attended a few WI meetings now but as work gets busier, I find that I don't have time to make a regular commitment to attend...oh noooo! 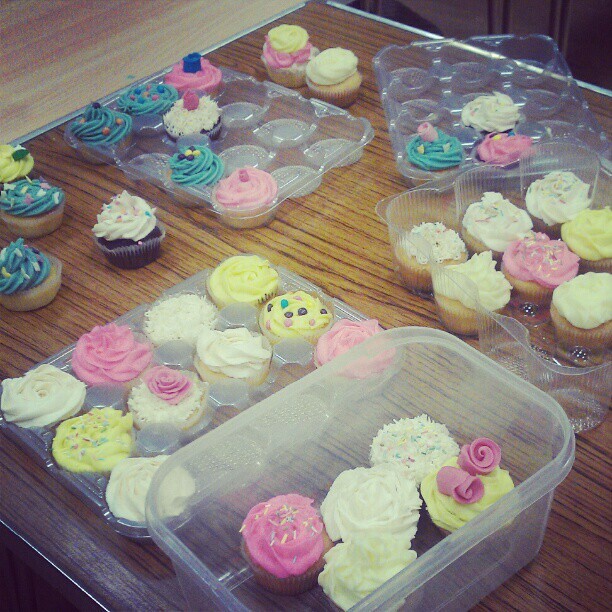 So you can imagine how I jumped at the chance when Kerry asked me to do a cupcake decorating demonstration...oh yaaaay! So last night I packed up my piping bags and set off to have some cakey fun. Of COURSE lots of the ladies were already a dab hand at swirling buttercream but we had fun nevertheless and I hope a few people will use their new found 'sugar rose' making skills to decorate their own yummy cakes. Kerry managed to make the brightest pink buttercream we have ever seen (!) 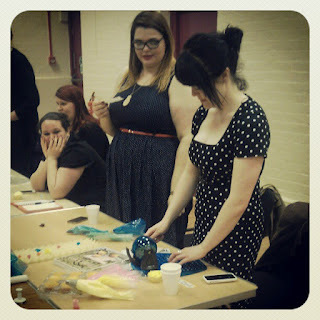 and we had lots of sprinkles and brightly coloured fondant to play with so I hope everyone had a good time and is inspired to undertake a bit of cake decoration this weekend. I thoroughly recommend popping along to your local WI if you can. I always have fun and have met some fab ladies who are ever supportive of my lil' business. We even got to play Irish Bingo - I mean, how much more fun can you get in one evening?? Oh and before I go, if you're a knitter then please pop by the Knit a Flower group where a group is collecting knitted flowers to decorate a boat that will represent Nottinghamshire in the Queen's Diamond Jubilee later this year. They need lots of contributions and will collect from the next WI meeting in May so get knitting!! Lovely post - thanks my dear!! Your piping skills were amazing to behold!